One year ago I embarked on a healing process as a result of unexpectedly uncovering a traumatic memory from childhood. Honoring my feelings and healing this trauma has been essential to fully loving and accepting myself. I have experienced many miracles in the past year thanks to my spiritual practice. And in the video I’m sharing today, I go deep on one of the most essential spiritual tools we have: prayer. I’ve spent many moments throughout each day turning to prayer and allowing myself to surrender to the guidance that was presented to me. Knowing the Universe has your back means you trust that when you pray, you will be led to guidance. Spirit delivers guidance in many ways, and through prayer we open an invisible door to allow that guidance to come in. This clip is a sneak peek of a talk I gave at an awesome online event called the Self-Acceptance Summit. Check out the video for a massive hit of inspiration and a simple, powerful prayer you can use daily. Then keep reading for details on this amazing digital summit and how you can join it. Join Me for the Self-Acceptance Summit! In my full presentation for the Self-Acceptance Summit, I share the steps I followed to reclaim my sense of safety, heal my wounds and accept myself fully. Today I am a whole, healthy and happy woman because I followed them faithfully! Whether you are healing from trauma or simply struggling to love and accept yourself, the Self-Acceptance Summit will help you quiet the ego voice of fear and cultivate compassion toward yourself to improve every area of your life. I joined 30 world-renowned teachers for the Self-Acceptance Summit to give you the tools and knowledge to transform the way you treat yourself every day! At the end of my talk I lead you through the Emotional Freedom Technique, one of my essential tools for instant relief and long-lasting healing. Thank you for being an answer to a prayer! I was thinking today about ridding my tendency to “find comfort” in being the victim and have been praying for release. I’m looking forward to the summit! Prayed for guidance in my run 30 minutes ago. Opened my email and there you were. Thank you! I loved this! Needed it this morning. Thank youuuu!! I’m so happy it served you, sister. I LOVE this conversation! I knew I dissociated or depersonalized the first 40 years living in a dream-like state as a result of early childhood trauma. However, I never connected dissociation and my Higher Power. Thank you for this re-connection! I can’t wait to meditate more upon it and teach it to those who seek it. In my mind, it’s all about re-connection, not only to the Universe, but most importantly, my body. As a person, who lived outside of it for so long, I needed to start there. Many blessings to you & your good work Gabby! In the video I’m sharing today, I go deep on one of the most essential spiritual tools we have: prayer. Check out the video for a massive hit of inspiration and a simple, powerful prayer you can use daily. i will choose to interpret this as my miracle for the morning…thank you for your light! This was a perfect message and reminder this morning as I woke up asking for universal guidance. I’m in the middle of the digital master class. It’s fabulous. Love the universe and so appreciate you, your gifts of teaching and your powerful energy and beautiful spirit. Just last night I was reminded of an old wound and here you are today with this video! Thank you for your guidance Gabby! Having a past with domestic and sexual violence, I’ve been craving to find something that will help me push past all the guilt I hold on to!! Thank you so much for this insight!! Exactly what I needed today! Xoxo Gabby! You are my angel Always delivering the messages I need to hear. You help me get out of my own head and I thank you for all your offerings. How did you add your photo to your name? Thank you for sharing sweet Gabby. I agree, you are an answer to a prayer. 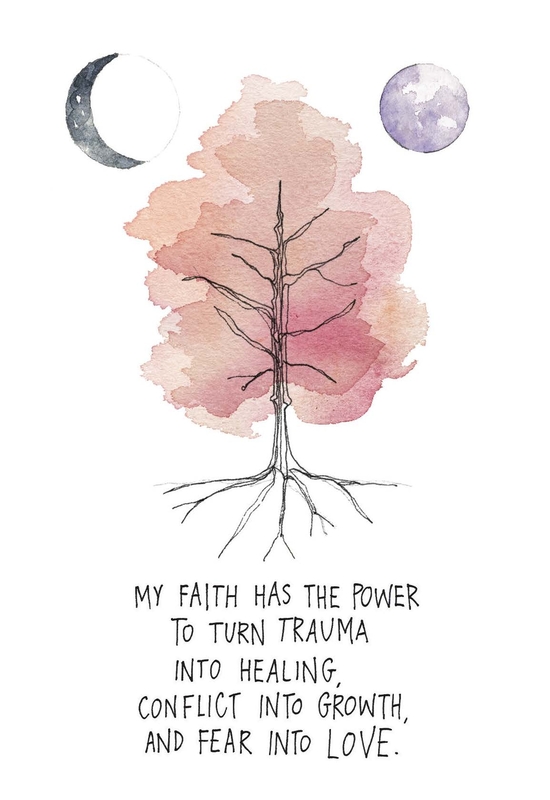 Most of the time our trauma speaks for us, whether we realize it or not, and when we heal the trauma we reclaim our voice. Will it be possible to get a time I can watch in Australia? Reach us by phone, Monday – Friday, 8am-5pm MT. US customers – 1-800-333-9185. Outside the US – 303-665-3151 and select option 3. Our email address is support@soundstrue.com. Thank you so much for sharing your experience and vulnerability. Thank you fir spreading the light. It is a blessing to hear that people walk a similar path to yours and that there is hope at the end of the tunnel of suffering. I have a quick question for you, is your natal moon in Piscis or in Aries? 1/11/79 can be either of them (depends on time of birth). I am asking you this because right now I am healing my own moon (=mom, inner child) in Aries, which means healing my inner child who is angry because she felt so invaded so many times by her inner circle, specially by mom, never being asked what she needed but rather being imposed. Did you have that during childhood? I don’t like to stick to the past but somehow I feel sometimes I haven’t forgiven my mother, I saw her a few days ago and started yelling at her as usual, for almost nothing, so unconscious, I feel so tyrant with her as I am with my closest partners, and I end up hurting those whom I love the most -precisely because of that unconscious association between love and aggression that I made during childhood. How to go from understanding it mentally to integrating and transforming it? I feel so guilty while impotent for not being able to control that at times… love, M.
I also recommend practicing the Meditation to Release Childhood Anger, which you can find in my book Miracles Now. Practicing this for 40 days will change you. You can practice it in the morning and the evening. Yogi Bhajan said that if you practice the meditation in the evening, when you wake up your whole energy will have changed. For more guidance, you can watch guided videos for this and other Miracles Now meditations. Thank you. I needed and wanted this more than I realized. Tears streamed down my face as I watched your brilliant words. Lots to pray on today. GABBY YOU ARE NOT GOING TO BELIEVE THIS. AS I WAS LISTENING TO THIS BLOG POST I RECEIVE A CALL FROM A THERAPIST THAT I WAS EXPECTING FOR A MONTH TO HEAL A TRAUMA THAT I’VE BEEN LIVING THROUGH ALL OF MY LIFE. THE UNIVERSE DEFINITELY HAS MY BACK. Wow! Just what I needed right now thanks Gabby! Yes! I LOVE this message. My family is full of victims (as is the world it seems), and despite my best intentions, I find victimhood coming out of my own mouth at times. Ugh. But I’ve observed that it never serves me in a higher vibration sort of way; it just begets more of itself. No thank you! Starting this video with “Honor the wound without being the victim,” was exactly what I needed to hear today and will likely be something I repeat to myself daily in the future. Family issues, gender issues, religious issues, race issues, moving through trauma, etc… can all be helped by this. We can presently be strong…not strong as in “I’ll push through this painful thing” (where we in reality feel small and weak) but truly strong in our presence and aura…calm and at peace in life. I prayed for something like this the other day. I sat on this email a few days, not ready to watch it. Today it fit me perfectly. When we allow it to be so, life can be crazy cool. Dear Gabby, I missed your talk and from what I see it would be so beneficial to me and my post traumatic healing process. Is there a way to listen to it now, or just purchase your talk without the whole summit? Thank you. Hi my love. Since I recorded this talk for an event I didn’t host, I’m not sure if you will be able to do that. But you can contact the Sounds True team to ask whether it might be a possibility. If you are in the U.S., the number is 800-333-9185. If you’re outside the U.S., call +1 303-665-3151. Or you can email support@soundstrue.com. If there are other resources I can share with you, just let me know. Two I can recommend are EFT (aka tapping) and EMDR treatment. For Tapping, you can check out Nick Ortner’s Facebook page, where he posts a lot of guided tapping videos. You can also check out the website he and his sister, Jessica, run, called The Tapping Solution. In every area of ur being….!!! May your dreams continue coming forth n may you continuously see that which u keep desiring. What Are Your Spiritual Assignments and How Can You Show Up for Them?